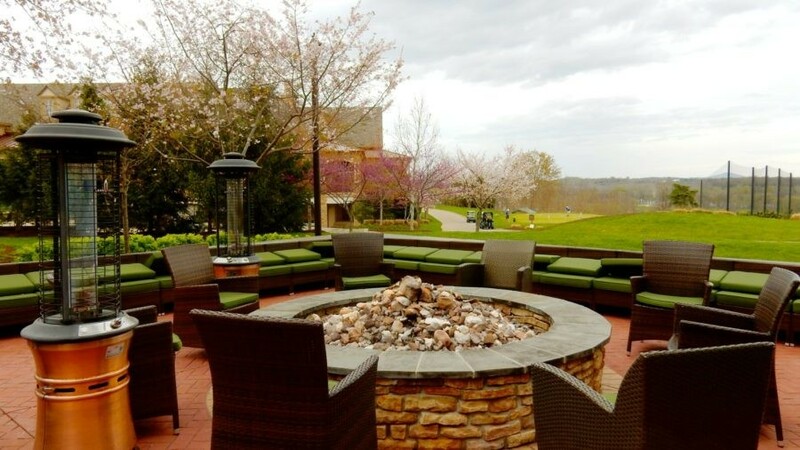 Newly added to the Destination Hotels collection, the 296-room Lansdowne Resort, bordering the Potomac River, is not your typical “boutique” or even a typical Getaway Mavens recommendation. First of all, it’s large and sprawling – with five pools – one an “adult only “Quiet Pool” – two and a half golf courses (a Greg Norman, a Robert Trent Jones, and a 9-hole junior course), a spa, and several restaurants. Secondly, Lansdowne was known specifically as a “Conference Center,” ideal for large groups, but not marketed as a place for leisure travelers. Third, rooms and public areas had become woefully outdated – with dark guest rooms and a vast lobby the opposite of cozy. But now, Lansdowne’s newly renovated rooms appeal more and more to families, groups of friends, and romantic couples of all ages. A work in progress, with more common area renovations to come, Lansdowne is spiffing up to compete in the upscale lodging category for leisure travelers. A bit tough to find, Lansdowne is tucked into a commercial park, across from a major hospital, and near an upscale housing development – all with the Lansdowne name. 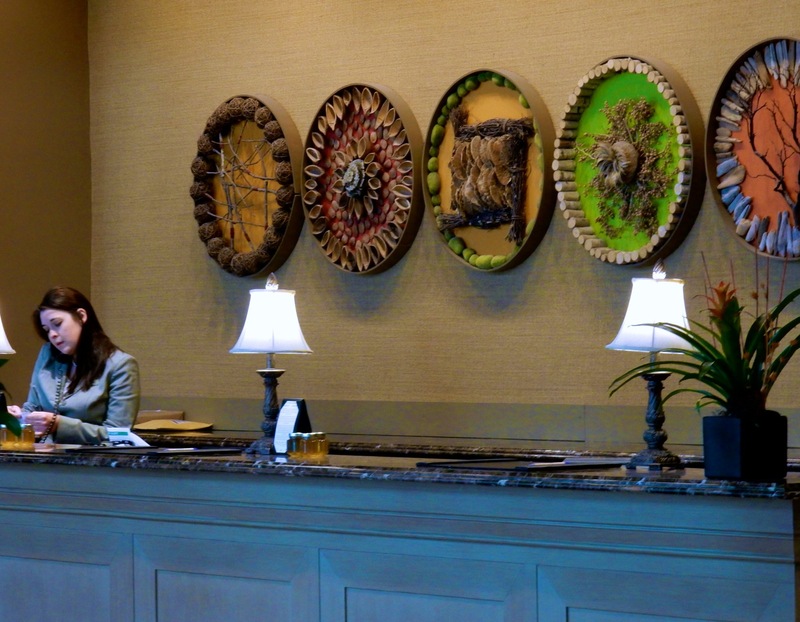 So, the front desk did not seem surprised to get another “help, I’m lost,” call from the road. The bellman provided driving instructions with a friendly gentle touch – a characteristic of most Lansdowne staff I encountered on a two-night stay there. The vast dark foyer is built for large numbers of people arriving at the same time, as intimate as Grand Central Station. But reception is warm and friendly, extended by staff who have been working at Lansdowne for years and treat guests like family. (Plans are in the works to renovate this and other areas of the hotel as well). 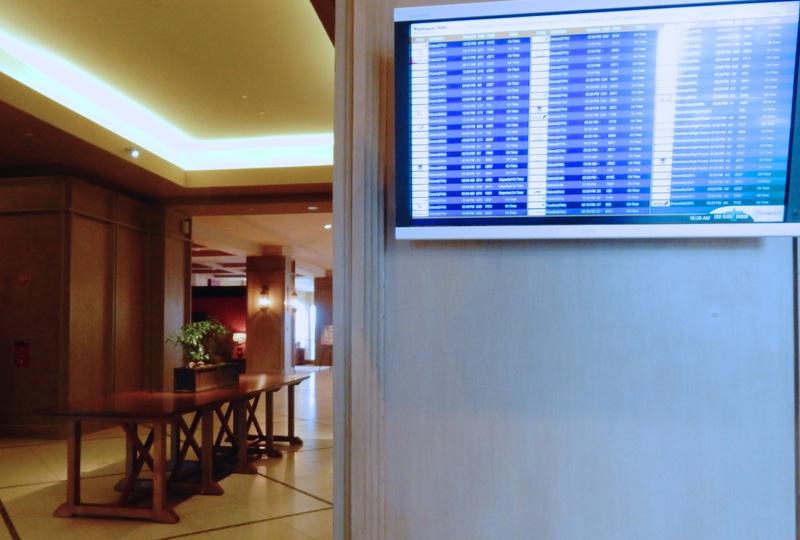 There’s an up-to-the-minute Dulles Airport flight information panel aglow on the wall of the lobby, so Lansdowne shuttle drivers can keep track of flight delays and show up when needed. 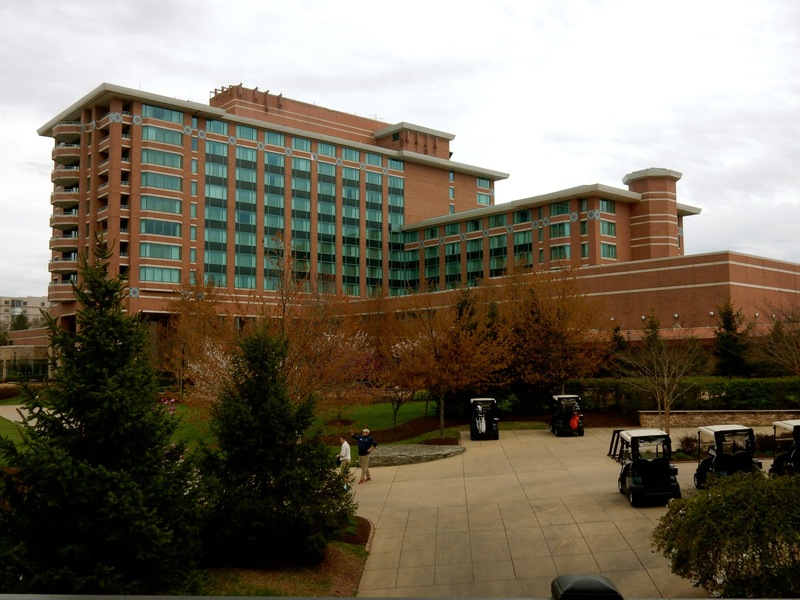 Lansdowne has largely been successful as a conference center due to the proximity of this international airport – a 15-minute drive away – which brings in visitors from all over the globe. And it’s also the reason that this resort is so convenient for a growing number of leisure travelers who can pop into town, stay on site, or daytrip to DC. 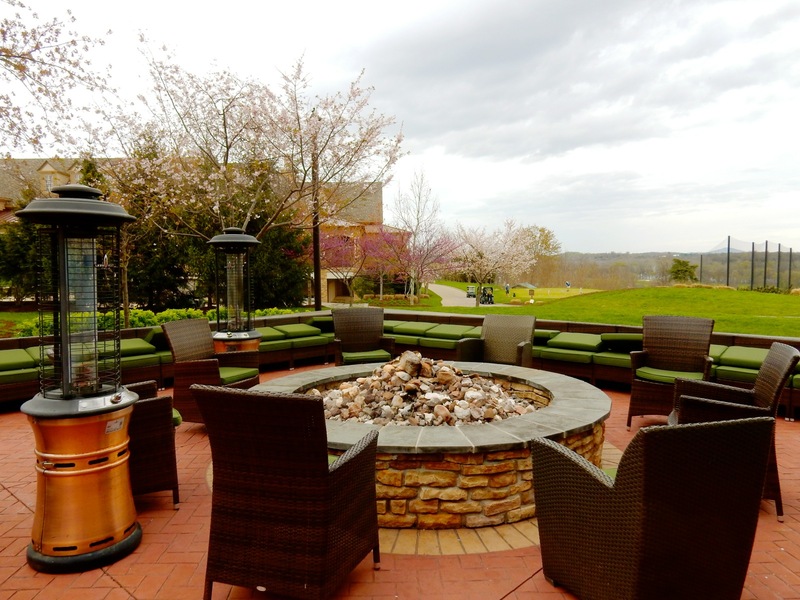 Ask for a corner room – or one that provides views of glorious sunsets over the Virginia hills. New décor, in hues of off-whites and soil – the brown terroir from which local wines emerge – is pleasing without being done to death. Photos on the wall above the bed’s quilted leather headboard bring in various aspects of winemaking. A cocktail cart holds two bottles of complimentary water (thank you!) accompanied by forrest green wine-bottle glasses. The two-tone leather façade and strap handles on a handsome chest of drawers create the illusion of the stacked luggage of a former, more romantic, era. It’s a pleasure to walk on the cool dark stone tile floor in the Pottery-Barn style bathroom that would been perfect with a walk-in glass shower. 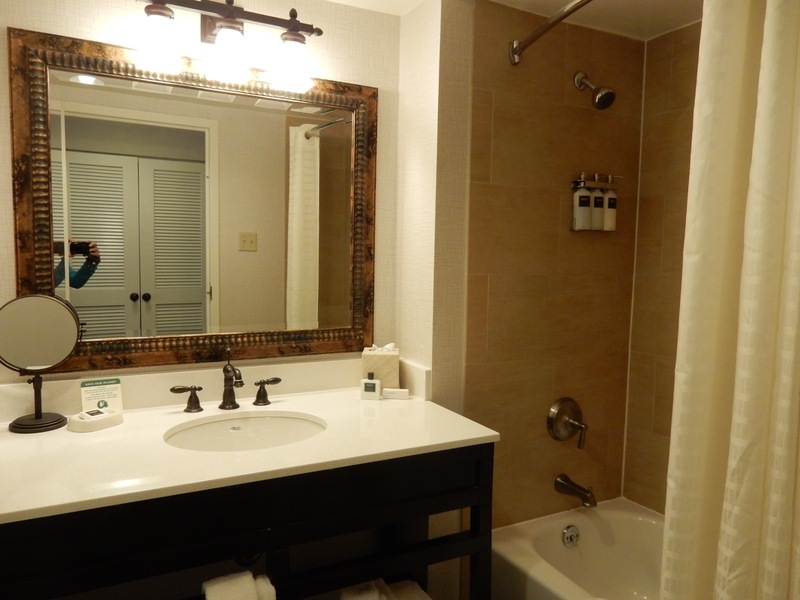 Regardless – it’s bright, with plenty of lighting and a large sink area complete with upscale toiletries. 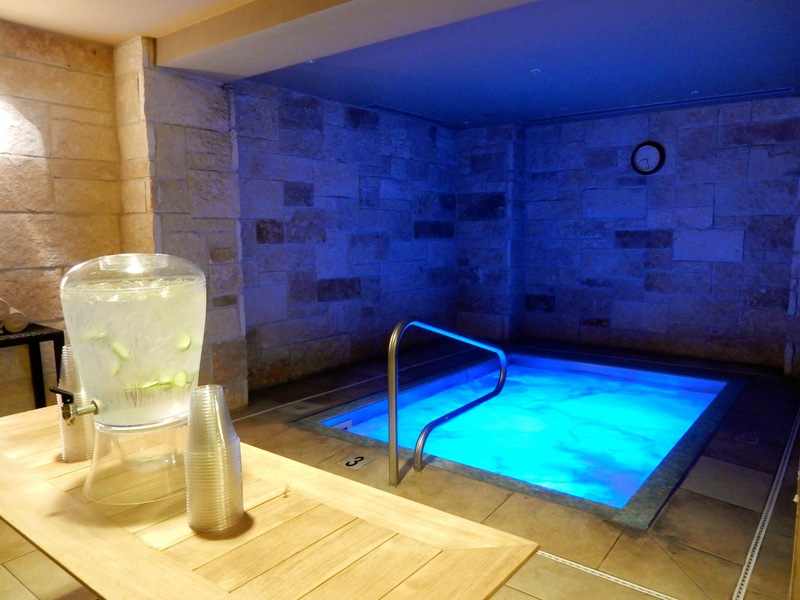 Spa Minerale, the onsite spa, employs the man voted “Best Therapeutic Massage Therapist in Loudoun County” – Ismail. All I can say is that you don’t need to sign up for any fancy treatments when Mr. Magic Hands & Elbows is around. Within minutes, Ismail zeros in on knots and tough spots that cause headaches and pain elsewhere in the body, working them out with a Medical Massage par excellence. My only regret is that I don’t live closer to keep him on retainer. Spa Minerale also now offers updated treatments, utilizing products straight from Loudoun County vineyards. Treat yourself to a Chardonnay Wrap (50 mins $165) or Cabernet and Cacao Cocoon (80 mins, $225), or just stick with Ismail’s restorative massage. It’s all good. 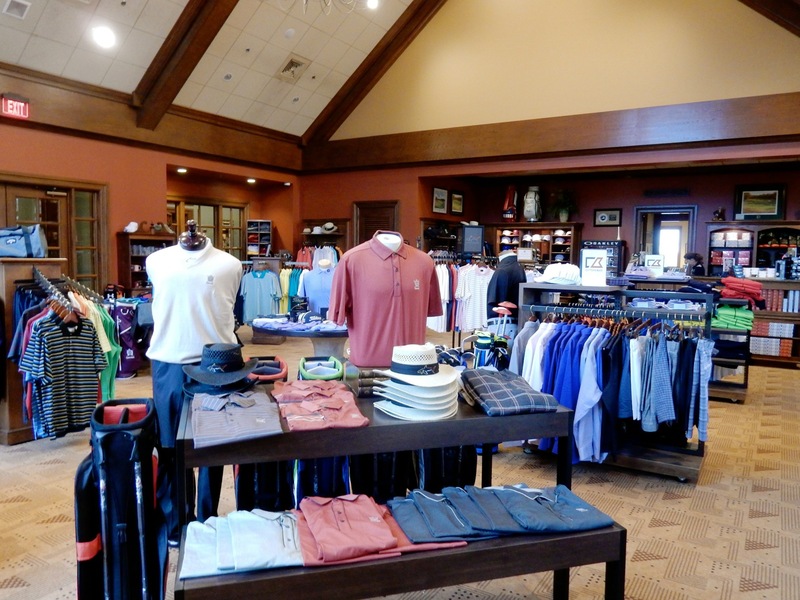 Golf: As mentioned above, Lansdowne has 45 holes of golf, representing two and a half 18-hole courses, and one of the best hotel golf shops in the region. 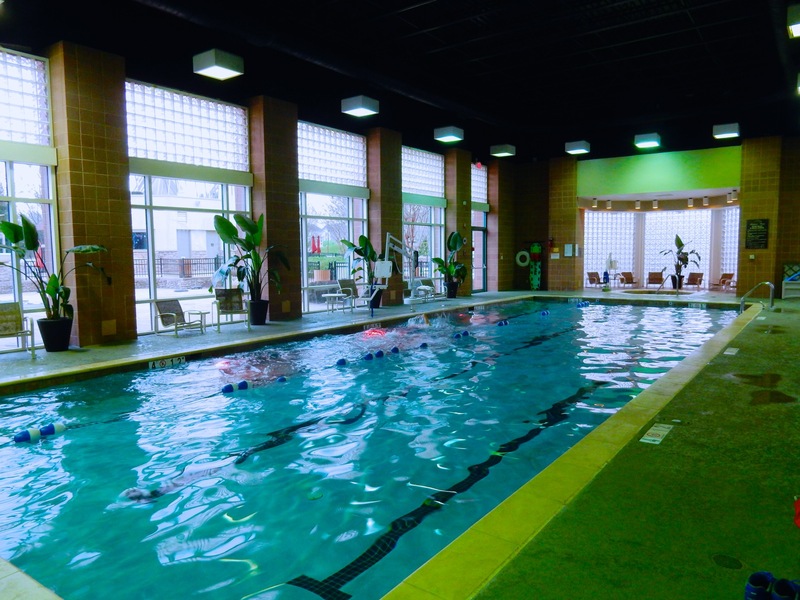 Pools: There are five pools in the complex; a large indoor pool and several outdoors- one a hit with kids as it’s got a park-like water slide. Coming up: poolside massage for couples who prefer their spa treatments en plein air. 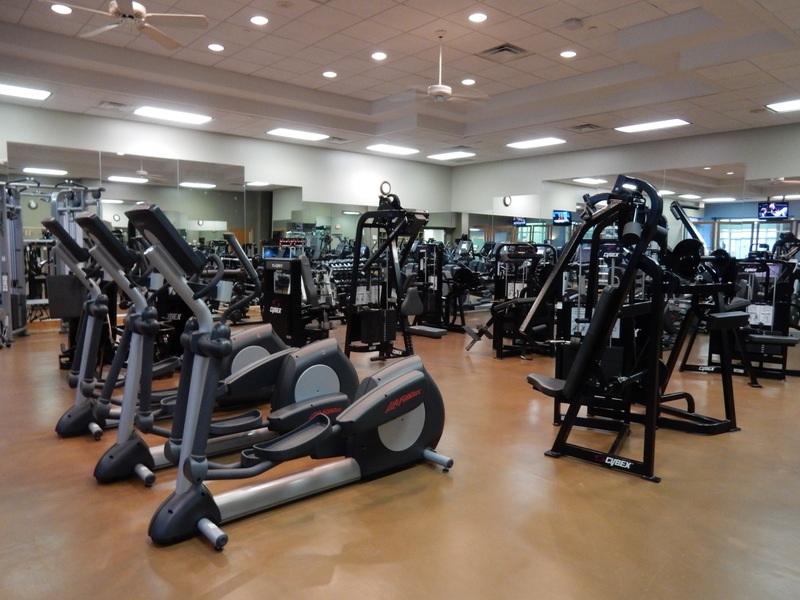 Fitness Center: Not content with a few treadmills, elliptical and weight machines, Lansdowne has a full-fledged Fitness Center, complete with Cross-Fit Training, spinning and, incredibly, a room dedicated solely to TRX. Destination Taste: As a new addition to the “Destination Hotel” group, Lansdowne highlights its regional assets through nibbles. At check in, grab a handful (or more) of Virginia Peanuts coated with Lansdowne Honey (from on-site hives), Ghost Pepper and a taste of Bourbon. Addictive. 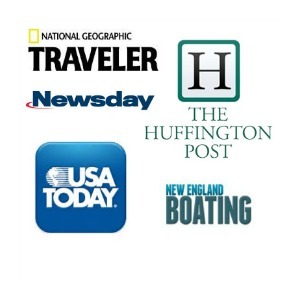 Rooms from $150-$350 depending on size and season. Does not include $32 resort fee/day – which allows access to Fitness Center, complimentary water in room, Yoga class, free in-room wi-fi, international calls, newspaper.